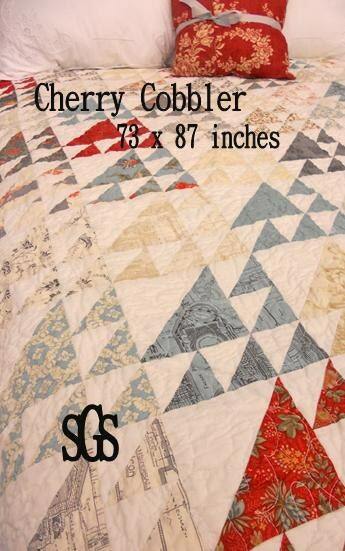 Cherry Cobbler pattern is 73 x 87 inches. It has clear directions printed in black and white along with a color front printed on cardstock paper. Pattern is held together with a metal brad paper fastener instead of a plastic bag. Pattern uses a layer cake and background yardage. Pattern designed by Mickey Zimmer for Sweetwater Cotton Shoppe. This listing is for PDF pattern only.